Manny Pacquiao joined the rest of the Filipinos appealing for the life of Mary Jane Veloso who is set to be executed in Indonesia for alleged drug trafficking. The Filipino boxing icon said that it will be a "great morale booster" if he could save her before his grand fight. In a video, Pacquaio asked President Joko Widodo of Indonesian for executive clemency to be grant to Veloso as she was only a victim of human trafficking and deception. Paquiao begs President Joko Widodo, on behalf of his countrymen to spare Veloso’s life from the schedule execution. He mentioned that he will soon be fighting in Las Vegas on May 2 in a fight considered as the fight of the century. He sadi that if he could save Veloso’s life, then it could be a great morale booster. Pacquiao is known to dedicate his fights to his countrymen and even to all Asians including Indonesia. 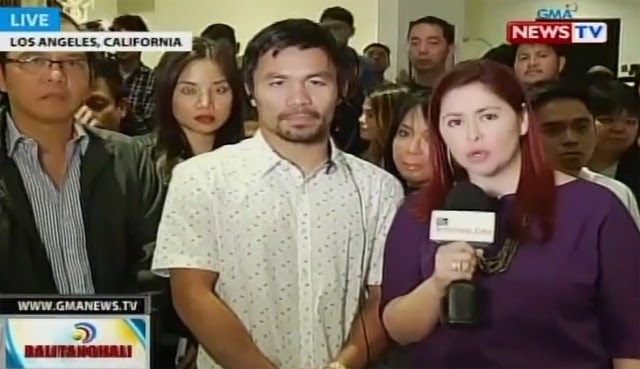 Dina Vanessa Mercado, Pacquiao’s staff, shared that an appeal video was released in the boxing icon’s various social media. The appeal was made as the family of Veloso requested him to speak for them. They believe that his status might help change the mind of the Indonesian government. Pacquiao even consulted his lawyers for such action after receiving the family’s request. Veloso had been intercepted in Yogyakarta airport after 2.6 kilograms of heroin was found in her possession in 2010. Her luggage was allegedly given to her by her recruiter who found a job for her as a domestic worker.